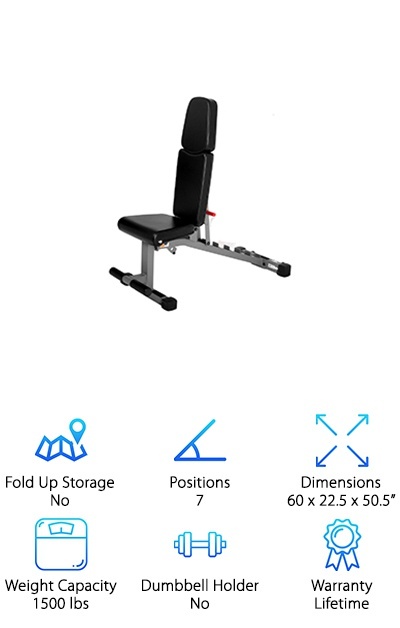 If you’re looking for a good adjustable weight bench to use at home instead of dragging yourself to the gym, never fear. We’re here to help you find the best adjustable weight bench. We researched some of the most popular and best-selling adjustable weight benches to put together our top ten list. But before we get to it, let’s take a closer look at some of the features you should consider when shopping for a weight bench like this. 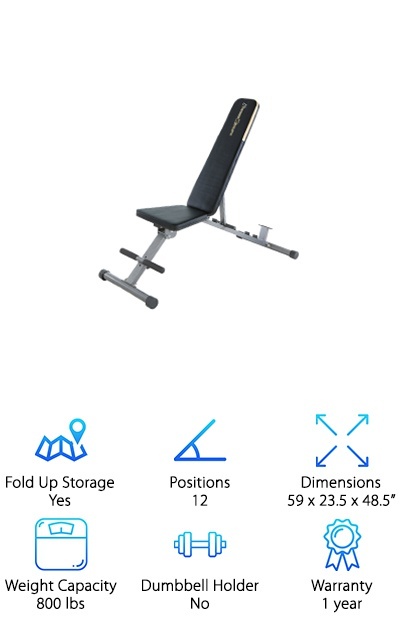 Fold Up Storage: The best thing about a weight bench that folds is that you can use it even if you have limited space. You can tuck it away in a closet or possibly under your bed when you’re all done! Positions: Generally, we’d say the more positions, the better because that way, you get more workout options. That said, some of the best benches we found have pretty limited positioning but make up for it in other ways. Dimensions: Make sure you have enough room in your home for whatever bench you choose. Keep that in mind even with the models that fold for storage. Remember, you still need to be able to use it. Weight Capacity :Each best weight bench has a weight capacity that includes the weight of the user combined with the weights being used. Some have separate weight limits for the user so make sure to check your bench’s specs. Dumbbell Holder: While it certainly isn’t necessary for a good weight bench, a dumbbell holder is a nice feature to have. You can keep them right on the frame of the bench so they’re always handy when you need them. Warranty: The warranties on these products varies a lot. Some are only 30 days while others last a lifetime. We always say, the longer a warranty, the better. But make sure you know the specifics of what it covers. Now that you know some of the key things to look for when buying a weight bench, let’s get right to our weight bench review. Here’s the deal: if you’re in a hurry but need to get some info, check out our top and budget picks first. Then stick around if you can for the rest of our list. We did a lot of heavy lifting to round up these products for you, so let’s get to it! Our top pick for the best weight bench for home gyms is this one from Rep Fitness. For starters, the solid steel ladder is adjustable from - 20 to 85 degrees so you can get a flat, incline, or decline position. It also has 4 different seat positions. The vinyl covered seat is really comfortable, too, in part because it’s made of 2.5 inches of thick padding but also because the gap between the seat and the back isn’t too big so it feels supportive. The rollers are covered in vinyl to keep your legs comfortable while keeping them locked in place. Guess what else? The vinyl makes it exceptionally easy to clean the seat and the rollers. All you do is wipe it off! When we saw the Nautilus Universal 5 Position Bench, we just had a feeling it would be our best weight bench for the money. It’s a pretty basic weight bench but it really performs well. You can put it in 5 different positions ranging from -10 to 45 degrees so you can do exercises that work your upper body and core muscles. There are comfortable 5-inch foam rollers to anchor your feet throughout your workout, too. And how’s this for an awesome feature: there are stabilizer levelers so it will be stable on any type of flooring. For a budget pick, it has a pretty impressive weight limit. 430 pound total for weights and the user. Some comparable benches can only hold up to 300 pounds! This is a best home workout bench because it’s so versatile. It’s great for dumbbell workouts and because it adjusts into 7 different positions, you can use it for a wide range of exercises. What positions does it go into? Everything from decline to flat to nearly vertical. This one folds pretty flat for easy storage but that’s not all. There are transport wheels so you can easily pull it from place to place if you need to relocate. Oh, and you won’t believe this: it comes fully assembled and ready to go. Just double check to make sure the bolts are tight and you can get started working out. 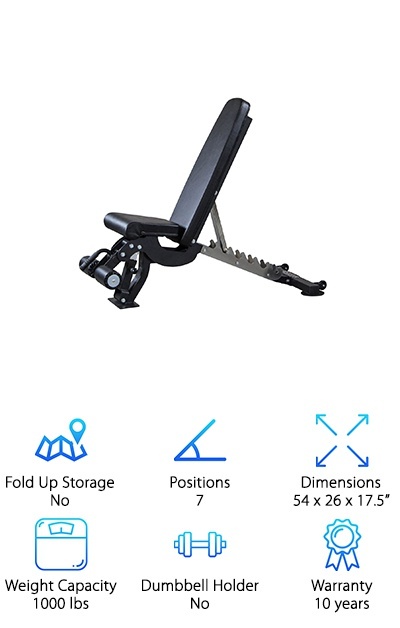 And this is the absolute best part about this folding weight bench: it comes with a lifetime manufacturer’s warranty. The next best weight lifting bench on our list has a lot to offer - including 12 different positions! You can adjust it into various angles from -20 to 80 degrees plus you can adjust the front leg into 2 different positions. If you prefer not to use the leg rolls, they’re easily removable. This is another great choice if you’re looking for a bench that folds for storage. And that’s not all, there are eve transportation wheels so you can easy transport and store it when you’re done. The durable steel frame is powder coated to resist any damage, too. For anyone looking for a bench who is on the tall side, rest assured this bench will work for anyone up to 6 feet 4 inches. If you’re looking for the best adjustable bench with dumbbell holders, the CAP Barbell Black Weight Bench is here for you. A rack for 2 dumbbells sits on the frame under the seat so you can keep them handy when you’re warming up and working out. This bench adjusts into 4 different positions: upright, flat, incline, and decline. When you need to anchor your feet, the foam rollers are really comfortable thanks to the thick padding. When you reposition yourself to work on your abs and leg raises, you’ll find the foam-covered handgrips are really easy to hold onto. 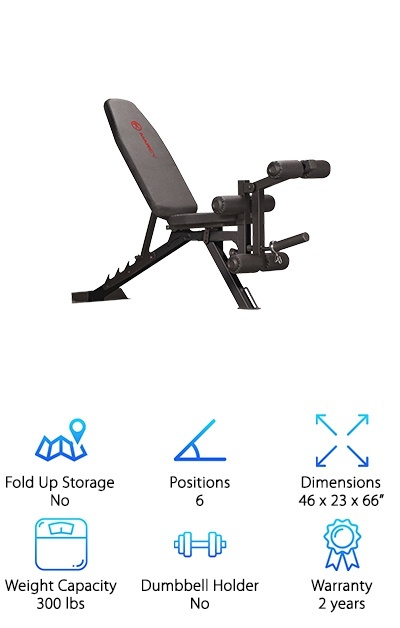 This is a great choice for a home gym that doesn’t have a lot of space because it’s slightly smaller than some of the other top picks. 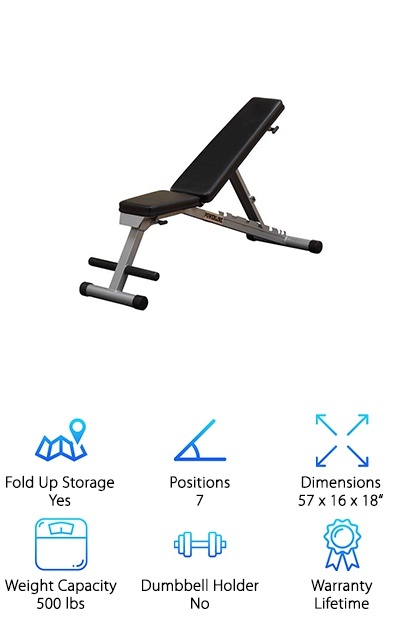 Another choice for best weight bench for home use, the Marcy Utility Bench gives you 6 different positions to choose from and easily moves from decline to flat to incline. A cool thing about this one is the leg developer. It can be repositioned so that not only can you use this bench to work on your upper body with dumbbells, you can use it to get in a lower body workout, too. It’s surprisingly comfortable, too, thanks to the vinyl covered foam rollers. The frame itself a black powder coated steel that looks super sleek and modern when combined with the black seat and back. That’s not all. It also has a transport handle and wheels so you can easily move it from one room to another. 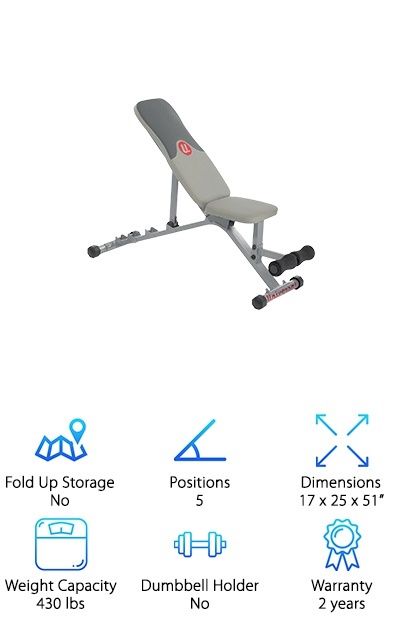 If you’re looking for something a little different for the best weight bench set for home, the Escape Fitness Deck Workout Bench is the most unique option on our list. Not only can you use it as a weight bench, it also doubles as a step bench for step exercise and other cardio. It’s easy to use and takes the place of other pieces of workout equipment not only will it save some space, it can save you some money, too. You can use it in incline, flat, and decline positions for your weight lifting exercises and it doubles as a step bench with 2 different heights. And get this: there are even clips so you can add resistance bands if you want to. This is a pretty impressive workout bench. To be completely honest, we were pretty impressed. 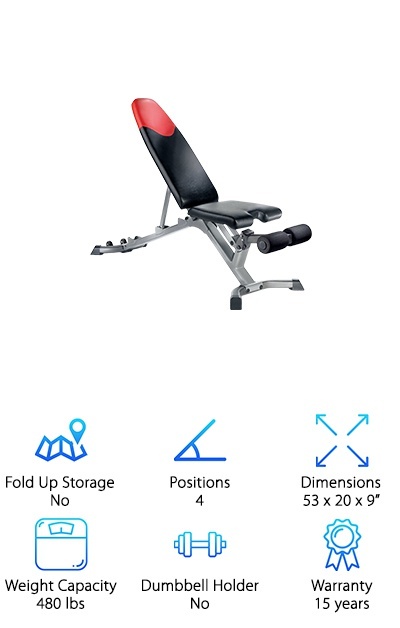 Despite the fact that it only has 4 positions, the Bowflex SelectTech Adjustable Bench can be used for more than 30 different exercises. You know how you know that this is an effective bench? It’s used by the astronauts in the International Space Station. It’s designed to correct your posture and provide stability for a safe workout. Considering how many exercises you can do with this bench, it has a relatively small footprint. This could be a simple way to get a complete workout if you don’t have a lot of room and don’t want to pay gym fees. Oh, and one more thing, we couldn’t quite believe the warranty on this one. 15 years! The thing that stood out the most for us about this bench is exactly how much weight it can hold. 1500lbs? What!? The steel construction is really strong and there are skid resistant feet to keep it from moving around as you work out. 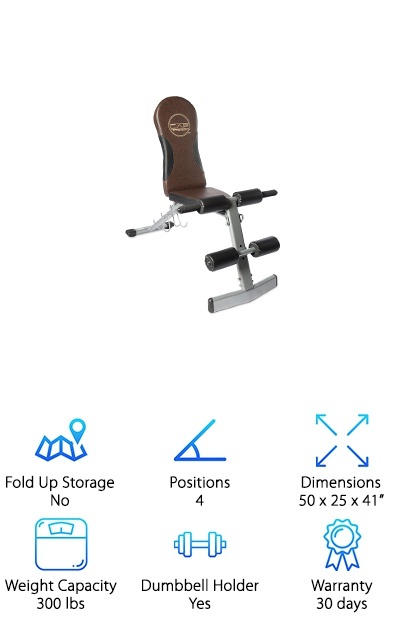 You can adjust it into 7 positions to get a full workout. Plus, the seat has 3 positions of its own. Speaking of the seat, it’s ergonomically designed and has 3-inch padding. Oh, and it’s in sweat and tear resistant vinyl. What does that mean for you? It’s super comfortable, durable, and easy to clean. This is a great bench to use in conjunction with other equipment, too, because it has transport wheels that make it really easy to roll it into place. If you want to take your best home weight bench and crank it up a notch, the Best Fitness Olympic Bench is waiting for you. This bench adjusts to 3 different positions: flat, incline, and upright. It’s easy to go from one position to the next, too. 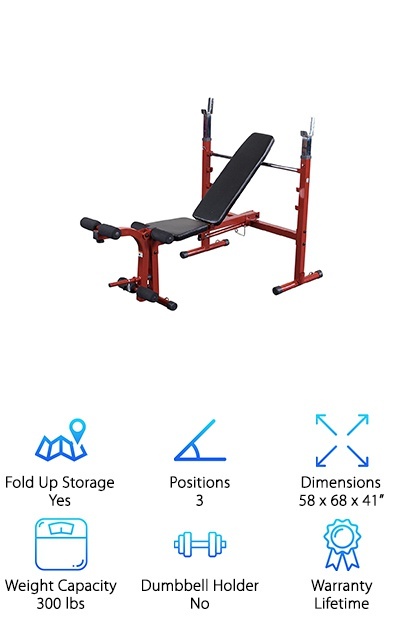 While you don’t get as many positions with this one as you do with some other benches, you can easily do chest exercises with this once since it has a weight bar. Not only that but the leg developer has a plate holder so you can add extra weight if you want to get a more intense workout. The frame is made of strong powder-coated steel that is really durable. So much so that there’s actually a limited lifetime warranty with this one.